X-Men greats Chris Claremont and Louise Simonson join artist extraordinaire Doug Braithwaite in a special 2-issue CHAOS WAR tie-in. As the Marvel Universe is destroyed pantheon by pantheon by the dark god, Chaos King, the rift between the underworld and Earth is violently ripped apart. How can a handful of deceased X-Men make a difference in Chaos Kings war against life? 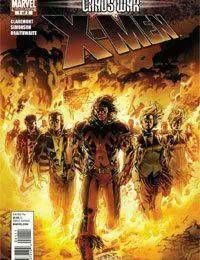 Get ready for the startling answer when the most unique team of mutants ever bands together to save the Earth from eternal darkness.